Horace Wellbeloved MA wrote an 1826 guidebook for visitors to London so that they missed none of the delights it had to offer. London Lions for Country Cousins and Beyond included the Horse Bazaar as something one must not miss, along with London Bridges new and old, Mr Busby’s self-moving Orrery and the Egyptian Hall, Piccadilly. The entire operation covered two acres of ground. It had space for around 400 horses and 500 carriages, all sold on the commission model. You could buy hunters and carriage horses, hackneys, ponies and ladies’ horses; phaetons, stanhopes, dennets, dog carts and pony gigs. 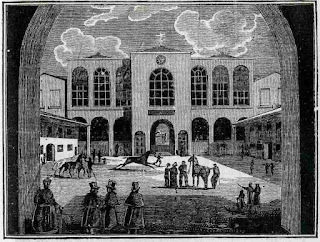 There was a ‘capacious riding-house’, room to exercise horses, saloons for harness and saddlery, and plenty for people to do should they tire of inspecting the Bazaar’s equine glories. The London Courier and Evening Gazette advertised ‘a Diorama of the Picturesque View of the PASS of SALZBOURG, with WATER-FALL’ in August 1828 – just one of many on show. There were three coffee rooms that could supply you with tea, coffee, sandwiches, ices, confectionery and fruit. There was a waiting room, as well as private subscription rooms (the largest was 133 feet long and 47 feet wide). In one year, the operation was said to have turned over more than half a million pounds (around a staggering £35 million today). The Horse Bazaar was staffed by an identically dressed army of grooms, who wore ‘white trousers, blue spencer jackets and blue foraging caps with white bands and top-knots – all silent as the members of a Carthusian convent’. The only sound to be heard was the tramp of horses’ hooves. This unexpected silence, wrote Terence Templeton, was due to the fact ‘no liquor is allowed to enter the bazaar’. ‘You may seek’, he said, ‘no other explanation of the mystery. A set of English ostlers and grooms would as soon think of talking without a tongue as without liquor to set it in motion.’ That the ostlers and grooms may have preferred silent communion with their horses to the chatter of tourists appears not to have occurred to him. 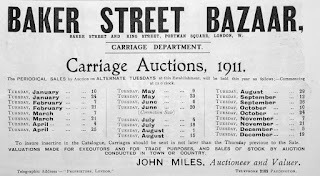 Horses and carriages were sold via weekly auctions: whether they were also sold outside these times, I am not clear, but I find it difficult to believe that a ready purchaser for a fine carriage horse would have been turned away. 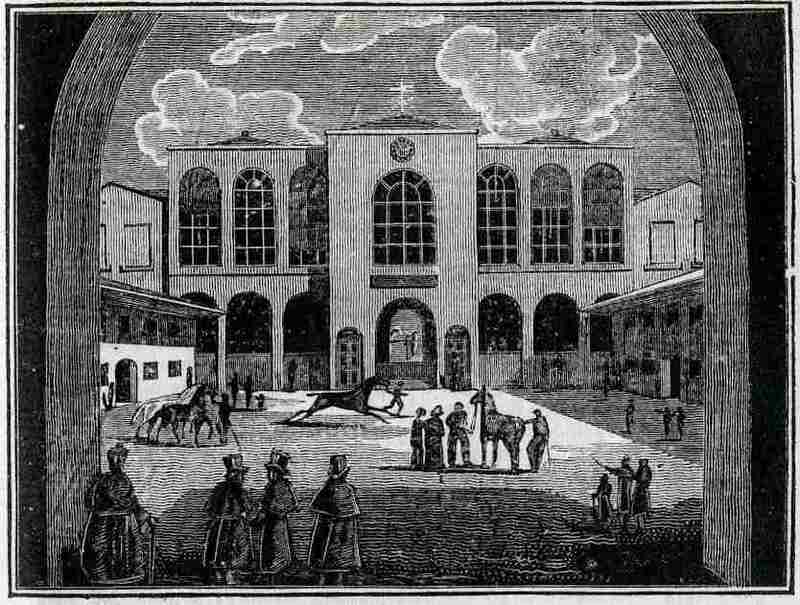 The auctions themselves were prey to at least some of the shenanigans that plagued horse selling then and now: a ‘Looker-on’ noted in the Sporting Magazine of November 1822 that two six-year-old horses were sold in quick succession as the sons of Sir Peter – a rare achievement, he remarked, as it was then 1822 and Sir Peter had died in 1811. The Bazaar was a huge social success. 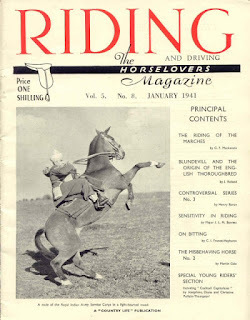 Young bloods of family and fashion visited, together with those ‘whose passion for horse absorbs and supersedes all others’, and those who made their living from horses. Many ‘ladies in the first rank and fashion’ visited daily, although only after noon, so that the stables were perfectly in order. Royalty appeared. In 1830, the London Evening Standard mentioned that Prince Frederick of Prussia had gone to inspect the Bazaar. All this glory was the responsibility of Mr George Young, the proprietor. Mr Young was not the owner of the whole: Templeton, in his long, long letter to his cousin Frank in the New Monthly Magazine and Literary Journal, 1825, hints that there was ‘another manager still more supreme.’ This was John Maberly, MP, who went spectacularly bankrupt in 1832, but the Horse Bazaar appeared to have found another owner, for it continued, with varied success. The Horse Bazaar’s success with fashionable visitors does not appear to have lasted: perhaps public taste simply moved on. But the Bazaar carried on being part of public life, in ways that you wouldn’t necessarily predict. It was the first home of Madame Tussaud’s waxworks, the site of the Smithfield agricultural show, and housed one of London’s first indoor ice rinks. 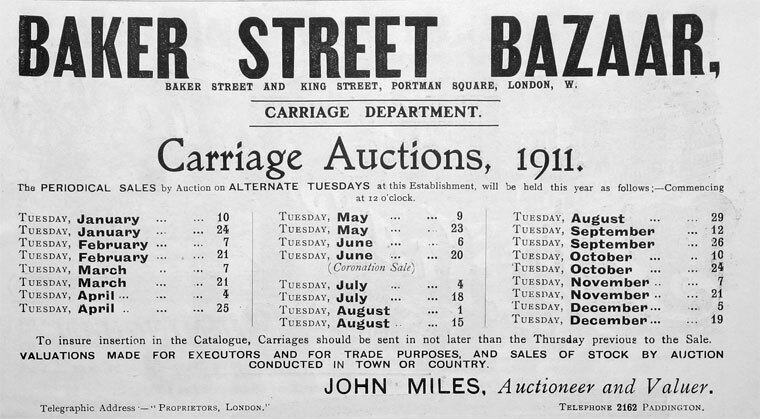 The Bazaar played its own small part in the political history of the nation due to the space it provided for mass meetings. In October 1831 the Reform Bill was rejected by the House of Lords. The bill was intended to make elections fairer and remove some of the abuses of the electoral system that then existed. Rather than constituencies, the country was then divided into counties and boroughs, which returned MPs. Some boroughs had very few electors: in one notorious case, Sarum Hill in Wiltshire, none, meaning that its owners, the Pitt family, could return whoever they liked as MP, with no opposition whatsoever. Other boroughs had as many as 12,000 electors. Neither was there any consistency in who could vote. Some boroughs required you to own land, with others merely requiring of their voters that they lived in a house with a hearth sufficient to boil a pot. There was huge general enthusiasm for the Bill, except amongst those who had most to lose. After the Lords threw out the Reform Bill, a meeting was called for the parishioners of Marylebone to assemble at the Horse Bazaar to ‘address the King, support his minsters and consult on the present state of affairs ... the inhabitants are desired to devote Monday next solemnly to these objects, to suspend all business and shut up their shops.’ So many people turned up (around 30,000, it was said, could not get in) that the meeting adjourned to Hyde Park, and then on to Regents Park in case the meeting was declared as illegal as being outside the parish boundaries. Partly as a result of the considerable public support for the Bill, the Reform Act of 1832 was passed, removing rotten boroughs, and (slightly) extending the vote. The Horse Bazaar’s extensive grounds allowed it to become home to the Smithfield Show (the country’s major agricultural show) in 1839, until the show moved to Islington in 1862. The show lasted four days, and attracted thousands of visitors, particularly after the Royal Family began to attend. Prince Albert both visited and exhibited. In 1844, a polled ox he had bred was bought for 60 guineas by Her Majesty’s butcher, and in 1848, he won first prize for the best Hereford ox. By 1842, when Charles Knight wrote Knight’s London, horses were no longer sold, but carriages and harness were, as well as furniture and stoves. The premises were described as ‘too extensive’, which is presumably why the waxworks exhibition, and artificial ice Knight described were now features. The Bazaar site provided a home for Madame Tussaud’s waxworks from 1836, and by 1867, Tussauds occupied much of the site. The equine element continued to decline as furniture sellers Druce, and Madame Tussauds expanded. By 1908, most of the site was occupied by Druce and Madame Tussauds, though there was still room for the storage of ‘empty coffins, false bears, volatile dukes, lead and bricks in bulk …’ as reported by Donald Shaw in London in the Sixties. The Horse Bazaar no longer exists. The Druce site was bombed in 1940, and took several more direct hits as the war progressed. The site was cleared, and the Horse Bazaar was replaced in 1957 by Marks and Spencer’s then headquarters, and is now the site of a complex of offices and shops. Google Earth reveals now not the faintest flicker of a horse. 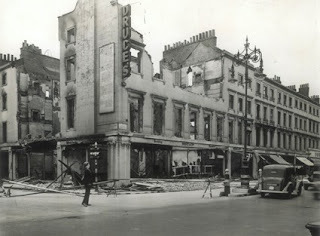 There is a piece of film footage of the fire after Druce’s was bombed. There’s no direct link, but you can see the piece here. 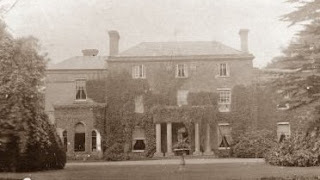 The Druce family were part of a famous Victorian court case: the Druce-Portland case, in which the wife of Thomas Druce claimed her husband had not died in 1864, but instead had resumed his life as the Duke of Portland. She therefore claimed her children were heirs to the dukedom. The case was dismissed. Samuel Godley, a hero of Waterloo, worked at the Horse Bazaar after leaving the army due to ill health. Copyright-free images of the Smithfield Show are surprisingly difficult to find, but follow this link and you’ll get some idea of what it looked like. Another image of the Horse Bazaar here. 'Papers: 1831', in London Radicalism 1830-1843: A Selection of the Papers of Francis Place, ed. D J Rowe (London, 1970), pp. 34-48. British History Online http://www.british-history.ac.uk/london-record-soc/vol5/pp34-48 [accessed 15 March 2018]. All other sources are referenced in the text.